Officially removed from the Brett Favre era, the Green Bay Packers have come into their own under quarterback Aaron Rodgers. And they justified their billing as favorites by winning their fourth championship ring against the Pittsburgh Steelers in Super Bowl XLV. TIME takes a look at some things you might not know about the franchise's storied past. 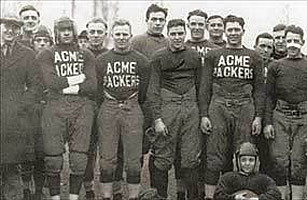 Early on in their history, the Green Bay Packers were the Acme Packers, taking their name from the Acme Packing Company. Though the original sponsor of the team was the Indian Packing Company, it was under Acme that the team joined the American Professional Football Association (soon to be the NFL) in 1921.